I have been fantasizing about cupcakes. Making cupcakes, buy eating cupcakes. I think this is the result of having nothing to do late at night but watch food network shows (ok so i have things to do i just don’t feel like doing them). Cupcakes really are amazing. It’s the awesomeness of cake in a little personal serving with delicious flavor combinations and cute decorations! What could be better? Uhh nothing. I have just recently entered the world of cupcake baking. All the flavors i’ve made so far i’ve been really pleased with. They are really time consuming to make, breast though. Especially since we only have one muffin tin and none of the fancy froster thingies or injecting thingies. But it’s still fun and i love giving them to people! Who doesn’t like receiving a cupcake? Crazy people, see that’s who! So far i’ve made chocolate cupcake with cheesecake filling and chocolate frosting (recipe courtesy of visionsofsugarplum.com). I also experimented with a nutella cupcake. I made a standard chocolate cake batter and the filling was a delicious mixture of nutella and cream cheese (a flavor combo that works really well together!). I then made this delicious chocolate frosting and added a ton of nutella and more cream cheese (can you say healthy?). It got really good reviews! If you didn’t catch on, I LOOOVVEEE nutella. It is so amazing! In my family it’s just called Angel Poop. It truly is that good! (haha). Nutella is yummy on bagels, waffles, pancakes, toast, in cupcakes, cake, on ice cream, with strawberries, with bananas, and with any other food in the world! It really is sosososososo good! My grandparents bought us (hem hem meee) these enourmous jars of nutella. Sometimes i just eat it with a spoon out of the jar. Yuum! 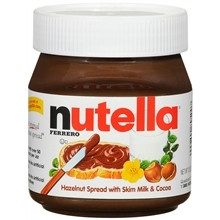 If you’ve never had nutella go out and buy some. now. i’ll wait. Haha so i’m done with that rant. I’ve been wanting to do a peanut butter cupcake! Doesn’t that sound amazing? I think so! Also a carrot cake cupcake. My family is a big fan of carrot cake (well everyone except for my sisters). And I love it too! My favorite part is the cream cheese frosting. Honestly i think it’s my favorite frosting in the world. Well maybe except for chocolate….it just depends. So I will be updating about new cupcake creations- and i’ll have pictures of them for you next time!